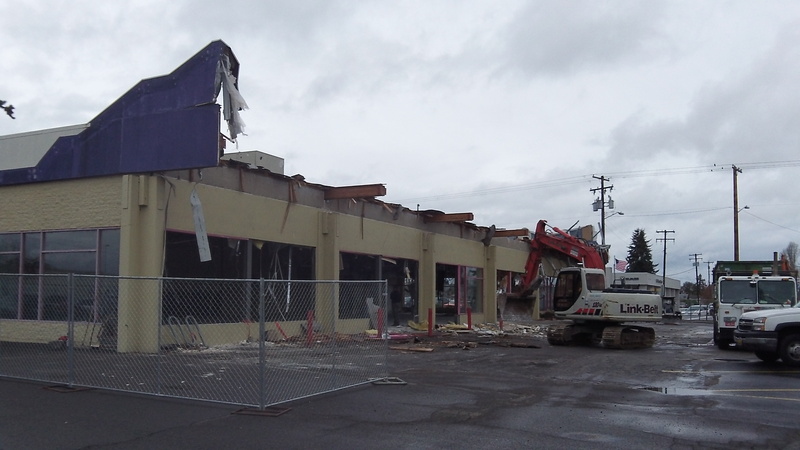 The demolition of the old Hollywood Video building in Albany was at this stage Wednesday. In case you missed it, last week I mentioned the perhaps less-than-exciting news that the Fred Meyer store in Albany was getting ready to demolish this former Hollywood Video store on its property. Well, on Wednesday the demolition had progressed, but the remnant of the “Hollywood Hills” false front was still visible. When getting its demolition permit from the city, the company had indicated it planned to take down the building and plant the site in grass. Chances are property taxes on a grassy lot facing Santiam Highway will be less than on an empty building, largely unused for the several years since the video store chain went out of business. Libraries are another good source for videos. Another insight; Fred Meyer is a profit making Company and if they could have rented it they would have. It is sad that the economy is so bad that no business persons are willing to take the risk to move to Albany and ad to or start up new businesses. So many empty businesses around and I personally see a slowing in the residential real estate market too. Look at all the vacancies, continual vacancies for years in the Heritage Mall. When these buildings get torn down or remain empty = a long term loss in jobs.